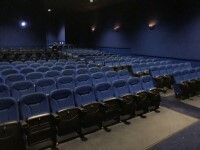 The cinema is located in the Westbrook Centre. 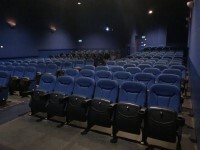 The cinema has 10 screens in total. 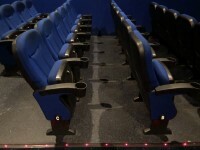 Screens 1-10 has/have step-free access. 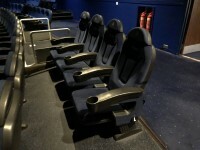 All screens have designated seating for disabled visitors. There is not a premium large screen format (isense) available. Tickets are free for companions/carers. 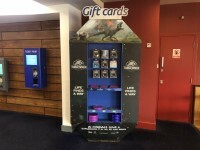 Visitors can use the Cinema Exhibitors Association Card at the cinema. 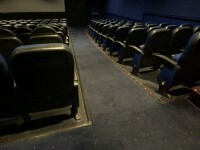 Films are rotated between screens. 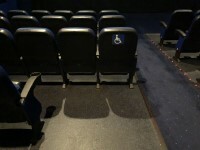 Assistance dogs are welcomed in the cinema screens. 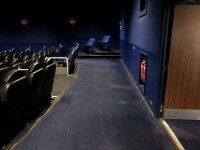 For more information on this cinema including opening times and film screenings please click here (new tab). You are on Audio Description, Subtitles and Autism Friendly. Skip to the next section. 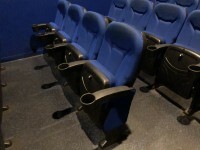 Films can be audio described. Headsets and Infrared systems are used for the audio description. 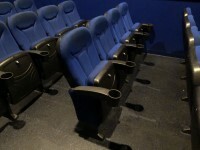 The equipment used has dual channel capability; one channel provides audio description, the other provides hearing enhancement for the film soundtrack. The body packs/headsets/neck loops are used for both channels. The audio description equipment is collected from a member of staff. 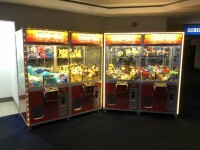 Staff are trained to issue equipment. 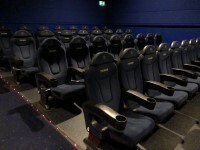 The screens used for audio description vary, please contact the cinema for more information. 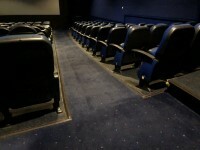 There is/are a minimum of 5 subtitled screening(s) per week. 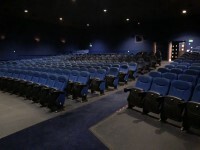 Subtitled screenings are available on weekdays only. 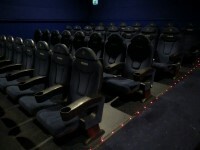 Subtitled screenings are available at a mixture of peak and off-peak times. 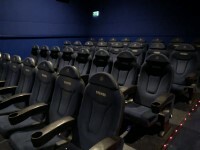 All screens can be used for subtitled screenings. 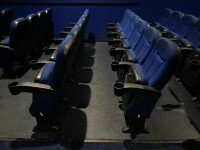 Autism friendly screenings are available. There is/are a minimum of 2 autism friendly screening(s) per month. 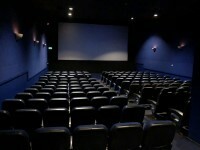 Autism friendly screenings are available on weekdays only. 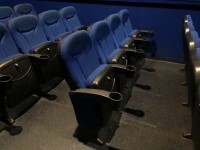 Autism friendly screenings are available at peak times only. 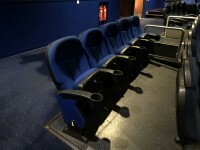 The screens used for autism friendly screenings vary, please contact the cinema for more information. 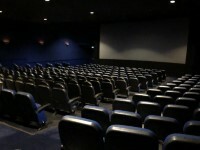 Advertisements or trailers are played before autism friendly screenings. 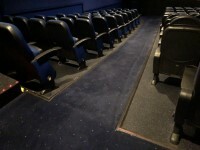 Autism friendly screenings start at the advertised performance time. 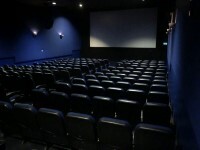 There is not a large white clock within the screen(s) showing autism friendly screenings. 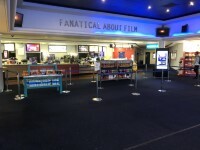 There is large, clear directional signage to the screen(s) showing autism friendly screenings. 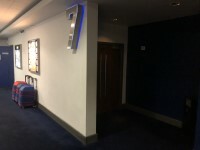 There is pictorial signage to the screen(s) showing autism friendly screenings. 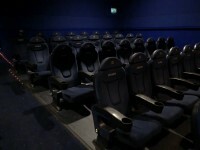 The lighting levels in the screen(s) showing autism friendly screenings are turned up a little. 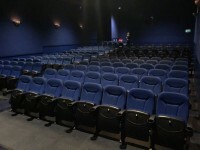 The sound levels in the screen(s) showing autism friendly screenings are turned down. 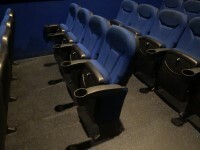 Site routing maps and screen seating plans are not available. 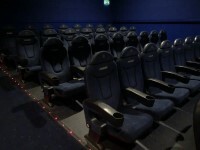 There is a quiet area available within the cinema. 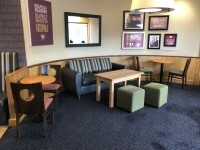 There is a chair/seat within the quiet area. 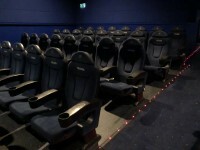 Guests can bring their own food and drink into the screen(s). 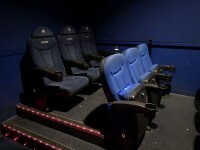 Carers/parents/companions can visit the cinema in advance to familiarise themselves with the surroundings. 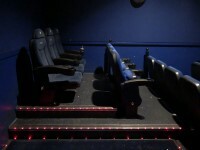 The cinema is easily accessible by road. From Junction 8 of the M62 take Burtonwood Road. At the roundabout take the first exit onto Westbrook Way. At the next roundabout take the third exit onto Westbrook Crescent. 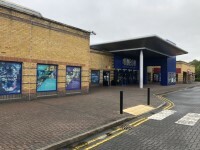 Follow Westbrook Crescent to the Westbrook Centre and the cinema. There is ample parking available. 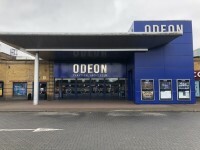 There is a bus stop within 150 metres of the cinema. 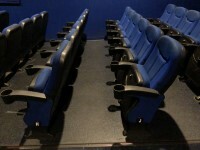 The UCI Cinema bus stop is approximately 104m (1 minute walk) from the cinema. For more information on Network Warrington please click here (opens new tab). The nearest Railway Station is Sankey for Penketh. 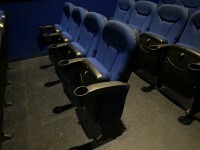 Sankey for Penketh Station is approximately 2.6km (31 minute walk) from the cinema. For more information on Northern Railway please click here (opens new tab). 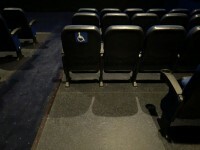 For the accessibility webpage on the Odeon website please click here (new tab). There is a member of staff available for help and assistance. 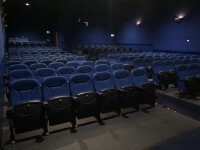 There is not a member of staff trained in British Sign Language, please phone the venue in advance for more information. The alternative formats documents can be provided in include; large print on request. 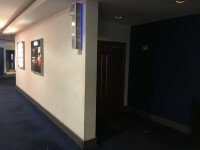 There is not an assistance dog toilet or toileting area at the venue/nearby. 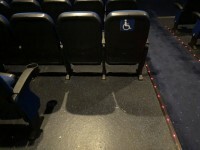 There are not mobility aids available. The telephone number for the Disability & Accessibility Helpline is 0800 138 3315. The textphone number for the Disability & Accessibility Helpline is 18001 0808 1560 609. 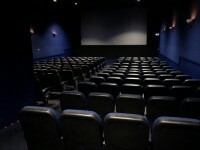 The telephone number for the Cinema Exhibitors' Association (CEA) Card is 01244 526 016. 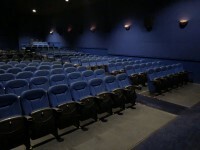 The textphone number for the Cinema Exhibitors' Association (CEA) Card is 18001 01244 526 016. 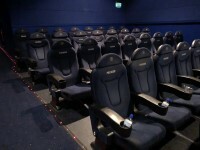 The email address for the Cinema Exhibitors' Association (CEA) Card is info@ceacard.co.uk. 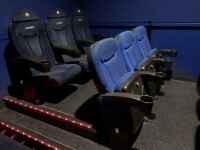 The website for the Cinema Exhibitors' Association (CEA) Card is https://www.ceacard.co.uk. 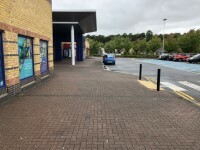 You are on Parking (Provided by ASDA (Westbrook Centre)). Skip to the next section. 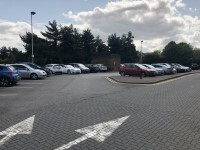 The venue has shared parking facilities. 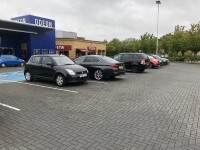 The cinema shares the supermarkets parking facilities. 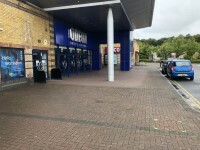 The car park is located in front of the venue. 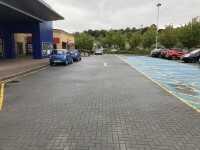 The car park surface is block paving. 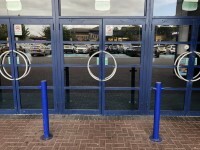 There is/are 9 designated Blue Badge parking bay(s) within the car park. 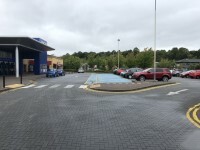 The dimensions of the designated Blue Badge parking bay(s) surveyed are 480cm x 560cm (15ft 9in x 18ft 4in). 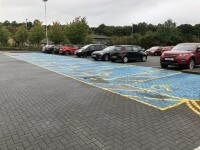 There is a 120cm hatched zone around the Blue Badge parking bay(s). Clearly marked/signposted parent and child parking bays are not available. 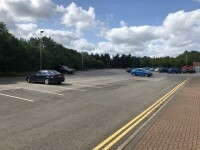 All parking spaces are provided on a first come first served basis. There is additional parking available to the left and rear of the venue. Parking is free for visitors of the venue. Assistance may be required because there is/are uneven surfaces. 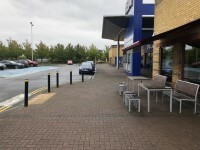 The surface on the approach to the entrance is block paving. 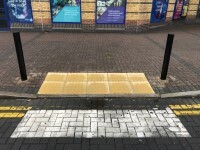 There is tactile paving on dropped kerbs between the car park and the entrance. 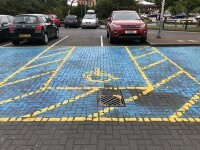 The nearest designated Blue Badge parking bay is approximately 20m (21yd 2ft) from the accessible entrance. There is not a/are not clearly marked drop-off point(s). You are on Approach. Skip to the next section. 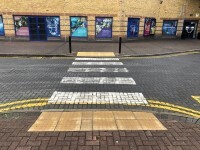 The surface of the approach is block paving. The approach surface is uneven in places. There is a/are fixed bollard(s) on the approach. The bollard(s) does/do not have a good colour contrast to prevent them being hazardous to visually impaired people. 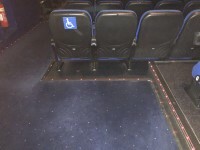 There is step-free access on the approach. This information is for the entrance located at the front of the building, on the left hand side. There is step-free access at this entrance. 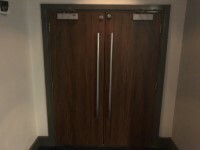 The main door(s) open(s) automatically (towards you). 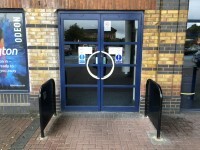 The main automatic door(s) is/are push pad or push button activated. 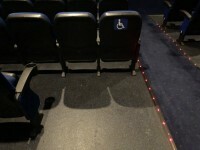 The push pad or push button is 70cm from floor level. 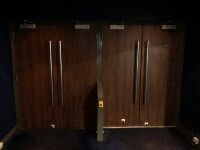 The width of the door opening is 155cm. 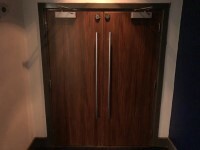 There is a small lip on the threshold of the entrance, with a height of 1.5cm or below. 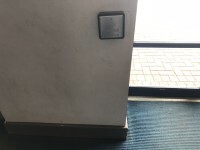 The exit push pad is at a height of 100cm. 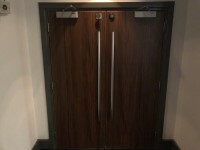 The width of the door opening is 160cm. 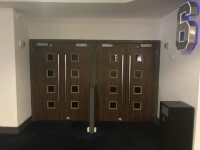 There are a total of 4 sets of double doors at the main entrance. 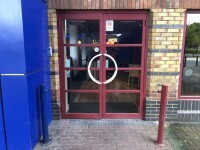 You are on Outside Access (Costa Entrance). Skip to the next section. This information is for the entrance located at the front of the building, on the right hand side. There is a dark mat or floor marking at this entrance that might be perceived as a hole. You are on Foyer. Skip to the next section. 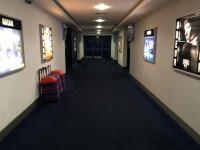 The cinema foyer is located ahead as you enter. 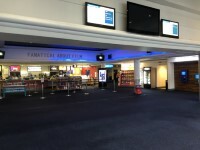 There is step-free access to the cinema foyer. 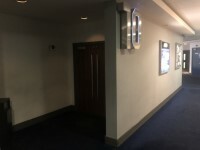 There is step-free access throughout the foyer. The type of flooring in the foyer is carpet and vinyl. 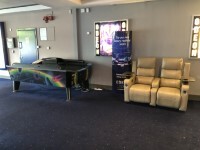 There is some flooring in the foyer which is shiny and could cause issues with glare or look slippery to some people. 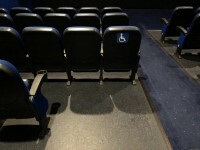 The nearest seating is located to the right as you enter via the accessible entrance. 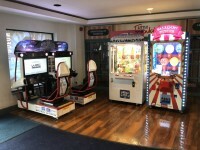 The foyer does play background music. 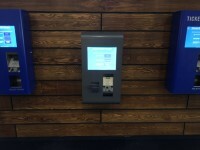 There is a self service ticket machine. The self service ticket machine is not at a suitable height for a wheelchair user. 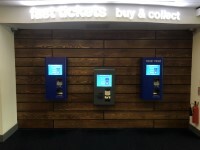 The self service ticket machine is 135cm high to the top of the screen. 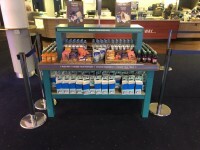 There is a/are food/drink counter(s) within the foyer. The counter(s) is/are located ahead as you enter. 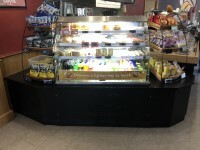 The nearest counter is approximately 30m (32yd 2ft) from the accessible entrance. The counter(s) is/are clearly visible from the entrance. There is step-free access to the counter(s). There is a clear unobstructed route to the counter(s). There are windows, TVs, glazed screens or mirrors behind the counter(s) which could adversely affect the ability of someone to lip read. The counter(s) is/are placed in front of a background which is patterned. The lighting levels at the counter(s) are good. The height of the counter(s) is/are 100cm. There is sufficient space to write or sign documents on the counter(s). There is a/are lowered section(s) of the counter(s). The height of the lowered section(s) at the counter(s) is 86cm. There is not sufficient space to write or sign documents on the lowered section(s) of the counter(s). 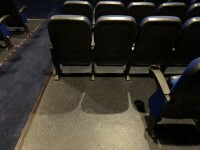 There is not a clear knee recess beneath the lowered section(s) of the counter(s). There is a hearing assistance system at the counter(s). The type of system is a fixed loop. The hearing assistance system is signed. 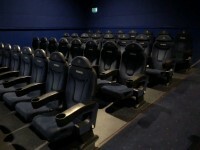 Staff are trained to use the hearing system. There are wall menus available. Menus are not available in large print. 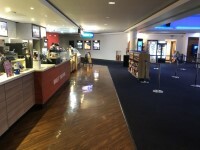 Staff can bring food/drink to screens if required. Tickets can be purchased from the food/drink counter(s). You are on Eating and Drinking (Ben & Jerry's). Skip to the next section. The following information is for the food and drink counter. 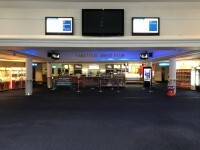 The food and drink counter is located ahead and to the right as you enter. 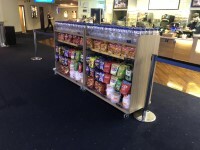 There is step-free access to the food and drink counter. 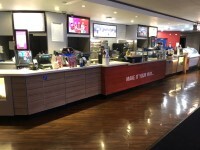 Food and/or drinks are ordered from the service counter. The height of the counter is 89cm. 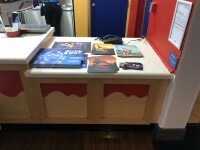 There is a lowered section of the counter. 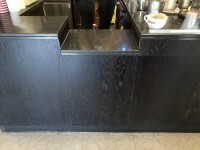 The height of the lowered section at the counter is 77cm. 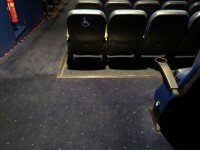 There is not a clear knee recess beneath the lowered section of the counter. 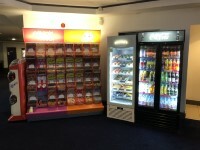 There is step-free access within the food and drink counter. This area does play background music. 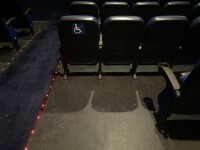 The type of flooring in this area is vinyl. The type of food served here is ice cream. 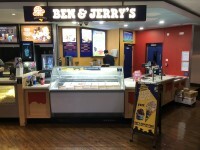 There are no tables and chairs available for Ben & Jerry's. 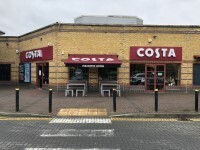 You are on Eating and Drinking (Costa). Skip to the next section. 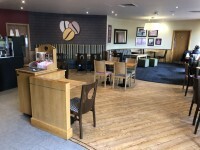 The café is located to the right as you enter via the accessible entrance. 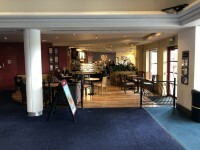 There is step-free access to the café. Food and/or drinks can be brought to the table. The height of the counter is 96cm. 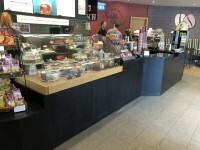 The height of the lowered section at the counter is 85cm. 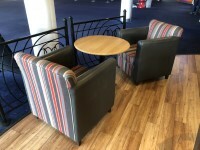 There is step-free access within the café. 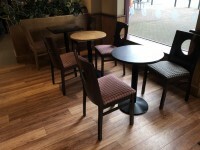 The type of flooring in this area is carpet, vinyl and tiles. Tables are not permanently fixed. 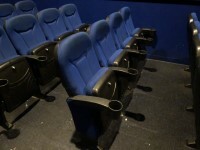 Some chairs have armrests on both sides. 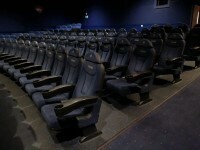 The nearest table is approximately 20m from the entrance/opening. 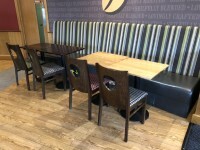 The nearest table is approximately 2m from the till/counter. 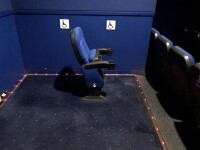 The distance between the floor and the lowest table is 52cm. The distance between the floor and the highest table is 72cm. 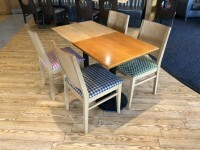 The standard height for tables is 72cm. 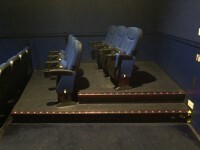 There is step-free access throughout the building. 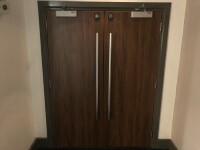 There are not doors in corridors/walkways which have to be opened manually. 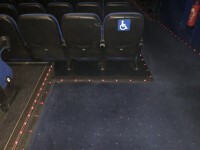 The type of flooring in corridors/walkways is carpet and vinyl. 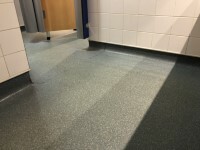 There is some flooring in corridors/walkways which is shiny and could cause issues with glare or look slippery to some people. 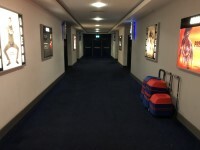 There is good colour contrast between the walls and floor in the majority of corridors/walkways. 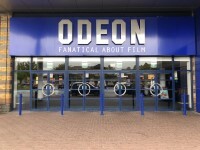 The colour, design and typeface of signs is consistent throughout the building. 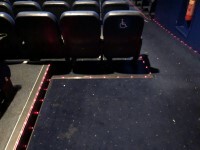 There is not a designated place of safety which can be used by people with dementia, autism or learning disabilities. This venue does play background music in public areas. 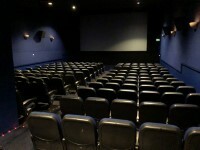 Music is played throughout the cinema. 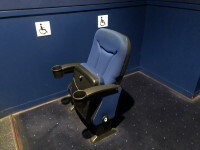 You are on Accessible Toilet(s) (Screen 5). Skip to the next section. There is an/are accessible toilet(s) for public use. 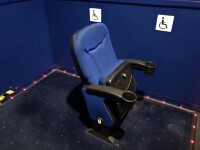 The accessible toilet surveyed is not for the sole use of disabled people. 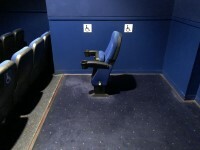 This accessible toilet is located ahead and to the left as you enter, opposite Screen 5. 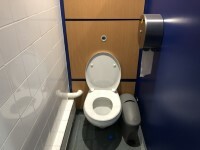 This accessible toilet is approximately 35m (38yd 10in) from the accessible entrance. 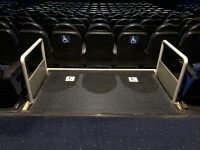 There is step-free access to the accessible toilet. 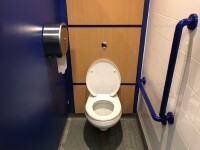 This is a shared toilet. The door is not self-closing. 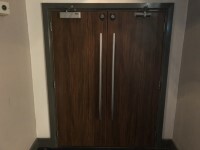 The width of the accessible toilet door is 98cm (3ft 3in). 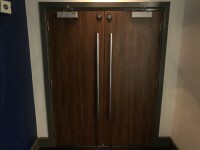 The door has a horizontal grab rail. 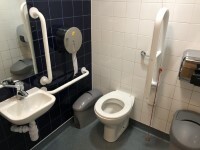 The dimensions of the accessible toilet are 140cm x 135cm (4ft 7in x 4ft 5in). The toilet has a non-slip floor. The lateral transfer space is 72cm (2ft 4in). 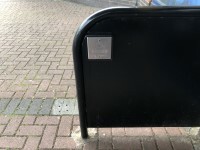 The transfer space is obstructed by the non-infectious waste bin. There is not a spatula type lever flush. There is not a flashing fire alarm beacon within the toilet. Disposal facilities are available in the toilet. There is a/are female sanitary and non-infectious waste disposal units. There is a/are wall-mounted grab rail(s) available. As you face the toilet the wall-mounted grab rail(s) is/are on the left. There is not a vertical wall-mounted grab rail on the transfer side. 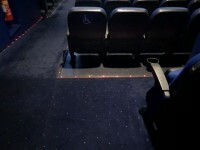 There is a horizontal wall-mounted grab rail on the opposite side of the seat to the transfer space. 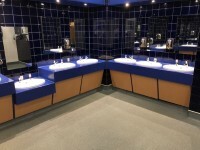 The mirror is not placed at a lower level or at an angle for ease of use. There is not a shelf next to the toilet. The toilet has a wall which acts as a backrest. The height of the wash basin is 74cm (2ft 5in). There are vertical wall-mounted grab rails on both sides of the wash basin. The wash basin tap type is lever. Taps have clear markings to indicate hot and cold settings. 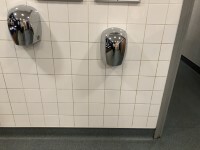 The height of the soap dispenser is 92cm. The hand dryer cannot be reached from seated on the toilet. You are on Standard Toilet(s) (Female and Male - Main). Skip to the next section. The female toilet facilities that were surveyed are located ahead and to the right as you enter. 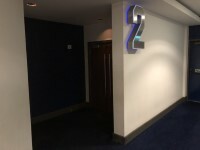 The female toilet(s) is/are approximately 25m (27yd 1ft) from the accessible entrance. There is step-free access to the female toilet(s). 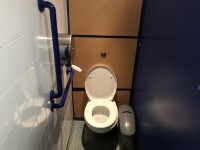 An ambulant toilet with wall-mounted grab rails is not available. 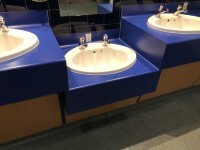 There is a lowered wash basin available. 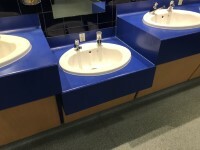 The height of the lowered wash basin is 62cm. There are no vertical wall-mounted grab rails at the lowered wash basin. The wash basin(s) tap type is push. There is a lowered hand dryer available. The height of the lowered hand dryer is 96cm. The male toilet facilities that were surveyed are located ahead and to the left as you enter. 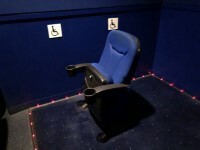 The male toilet(s) is/are approximately 15m (16yd 1ft) from the accessible entrance. There is step-free access to the male toilet(s). There is a lowered urinal available. 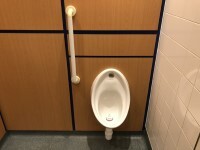 The height of the lowered urinal is 45cm. There is a vertical wall-mounted grab rail on the left hand side of the lowered urinal. The lowered urinal does contrast visually with the wall. 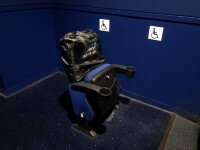 There is sufficient space for a wheelchair in front of the lowered urinal (90cm x 140cm). 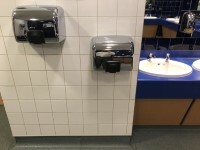 The height of the lowered hand dryer is 90cm. 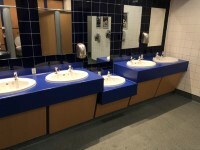 Baby change facilities are located within the female and male standard toilets. There is step-free access to the baby change facilities. 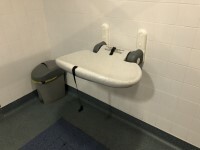 The baby change table is not set against the wall, permanently fixed at 75cm from the floor. The baby change table is not height adjustable. 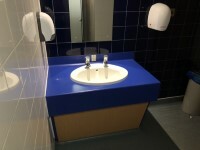 The baby change table in the female toilet is 97cm in height. 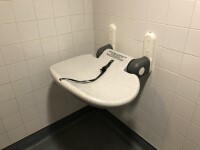 The baby change table in the male toilet is 93cm in height. The male toilet has a cubicle with a horizontal and vertical grab rail on the right only. You are on Standard Toilet(s) (Female Only). Skip to the next section. The female toilet facilities that were surveyed are located to the left as you enter. 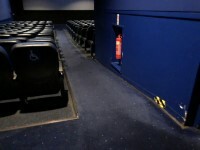 The female toilet(s) is/are approximately 6m (6yd 1ft) from the accessible entrance. There is not a lowered wash basin available. There is not a lowered hand dryer available. 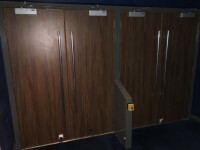 The cubicle has a horizontal and vertical grab rail on the left only. There is a very slight slope leading up to the toilet cubicle. You are on Screen (Screen 1). Skip to the next section. The screen(s) is/are clearly signed. The name/number of the screen surveyed is Screen 1. This information is for the entrance located ahead and to the left as you enter. 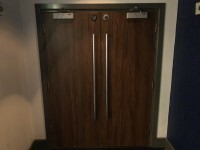 The width of the door opening is 135cm. 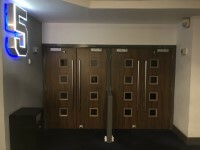 The entrance door(s) is/are permanently held open before and after screenings. 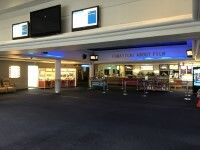 There is not a member of staff available for assistance at this entrance before and after screenings. 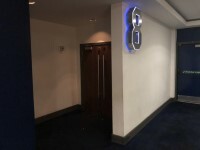 This entrance gives access to Row Q (back row). 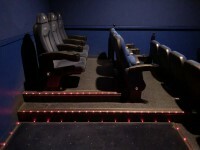 The type of flooring is carpet and vinyl. 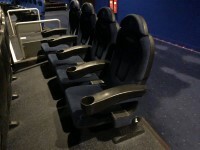 There are flip-down seats with armrests on both sides. 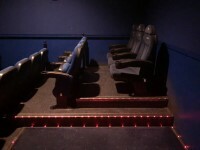 Premium seating is available within the screen. 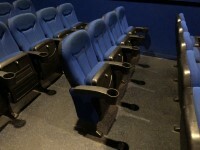 The width of the rows of seating is 26cm. 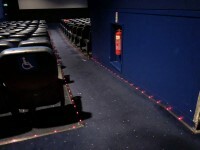 The lighting levels before and after screenings are adjustable. 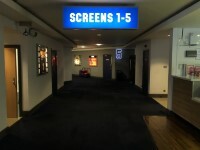 The nearest accessible toilet is located to the right as you exit the screen, opposite Screen 5. 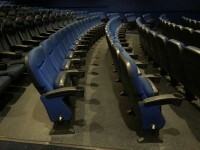 The access to the majority of seating is located in the centre of the seats. 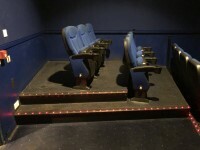 There is ramped/sloped or stepped access to the majority of seating. The gradient of the ramp/slope is steep. There are not handrail(s) at the ramp. 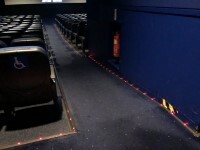 The lighting levels at the ramp/slope are adjustable. 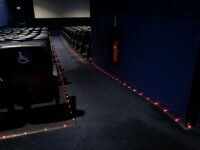 The ramp/slope is clearly illuminated before and after screenings. 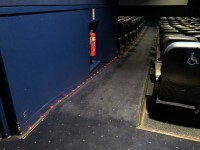 The ramp/slope is clearly illuminated during screenings. The depth of the step(s) is/are not between the 30cm and 45cm. 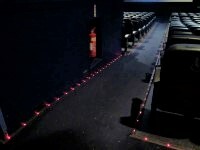 The lighting levels at the step(s) are adjustable. 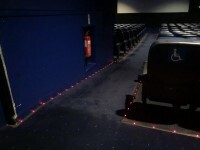 The steps are clearly illuminated during screenings. 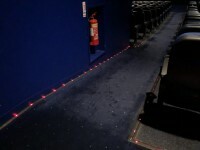 The steps are clearly illuminated before and after screenings. 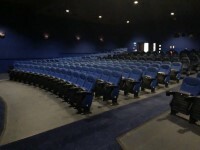 The designated seating area(s) is/are located in Rows Q (back row) and D (fourth row). 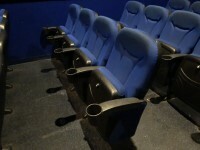 The designated seating area(s) is/are clearly signed. 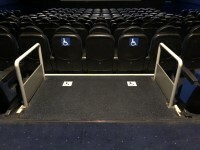 There is/are 2 designated space(s) for wheelchair users in this screen. 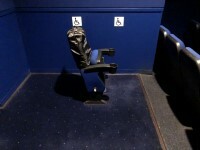 Wheelchairs may be left with the patron. 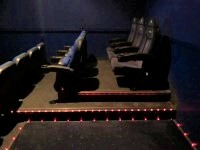 The visibility of the screen from this seating area is good. Companions/carers sit next to the patron. There is sufficient space for an assistance dog to rest next to you. 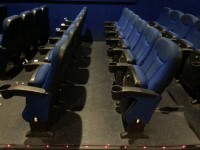 There is level access to the designated space at the rear of the screen (Row Q). 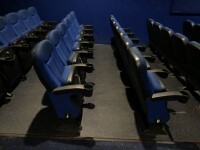 There is a steep slope to the designated space at the front of the screen (Row D). 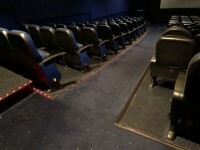 The designated space at the rear of the screen (Row Q) is approximately 20m from the front of the screen. 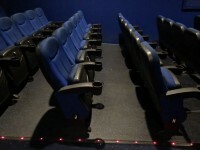 The designated space at the front of the screen (Row D) is approximately 5m from the screen. 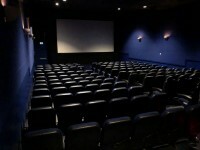 You are on Screen (Screen 2). Skip to the next section. The name/number of the screen surveyed is Screen 2. 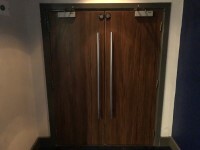 The width of the door opening is 130cm. 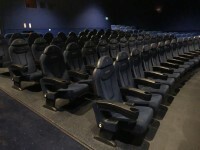 The width of the rows of seating is 30cm. 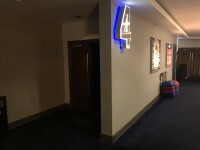 The nearest accessible toilet is located ahead and to the right as you exit the screen, opposite Screen 5. 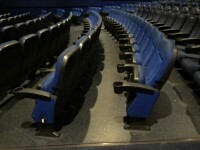 There is ramped/sloped access to the majority of seating. The width of the ramp/slope is 90cm. 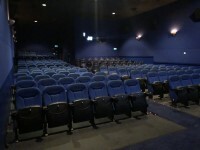 The designated seating area(s) is/are located in Rows Q (back row) and D (fourth row), to the right of the screen. 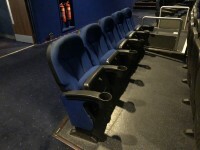 The designated space in Row Q is clearly signed. 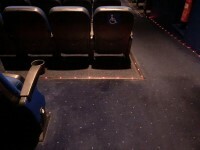 The designated space in Row D is not clearly signed. 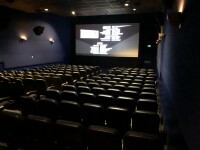 You are on Screen (Screen 3). Skip to the next section. The name/number of the screen surveyed is Screen 3. 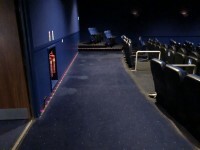 The nearest accessible toilet is located to the left as you exit the screen, opposite Screen 5. 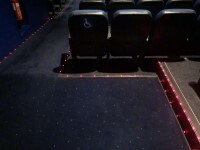 The ramp/slope is not clearly illuminated during screenings. 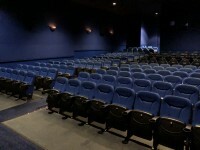 The designated seating area(s) is/are located in Rows Q (back row) and D (fourth row), to the left of the screen. 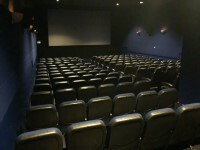 You are on Screen (Screen 4). Skip to the next section. The name/number of the screen surveyed is Screen 4. 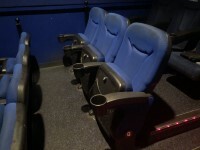 You are on Screen (Screen 5). Skip to the next section. The name/number of the screen surveyed is Screen 5. 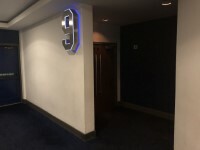 This entrance gives access to Row L (eleventh row). 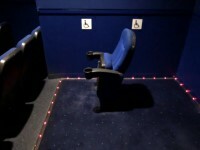 The nearest accessible toilet is located ahead and to the left as you exit the screen. 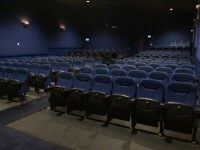 The designated seating area(s) is/are located in Row L, in the centre of the screen. 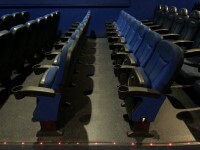 The designated seating area(s) is/are approximately 20m from the front of the screen. 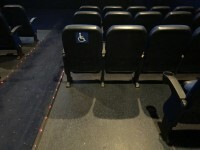 There is step-free access to the designated seating area(s). 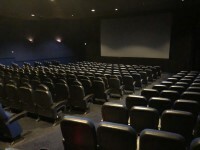 You are on Screen (Screen 6). Skip to the next section. The name/number of the screen surveyed is Screen 6. This information is for the entrance located ahead and to the right as you enter. 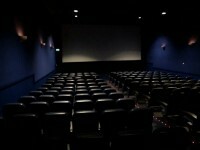 You are on Screen (Screen 7). Skip to the next section. The name/number of the screen surveyed is Screen 7. 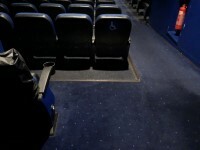 The nearest accessible toilet is located to the left and ahead as you exit the screen, opposite Screen 5. 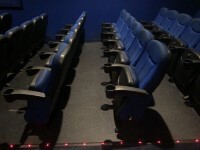 There is a steep slope to the designated space at the front of the screen (Row E). 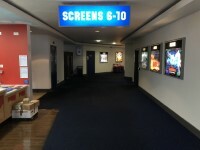 You are on Screen (Screen 8). Skip to the next section. The name/number of the screen surveyed is Screen 8. You are on Screen (Screen 9). Skip to the next section. The name/number of the screen surveyed is Screen 9. 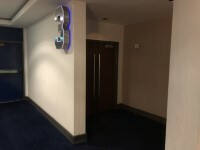 The nearest accessible toilet is located to the right and ahead as you exit the screen, opposite Screen 5. You are on Screen (Screen 10). Skip to the next section. The name/number of the screen surveyed is Screen 10.